Welcome to Issue #100 of the Bootleggers Buzz! It is a bird! Noooo, a plane! Wait, it is the Empire State Building! No. No. No. It is round 8, starting April 5th, 2014! Yes ladies and gentlemen, this week the Elite Guard revealed the date of the coming reset and the start of a new round. That event makes this Issue extremely special, as it is the hundredth issue and also the last issue of round 7. Grab your tissues, because the Buzz Team is going emo! The hundredth issue. A milestone, an achievement and something I am deeply proud of. Whether you care or not, I’d like to take this opportunity to thank all the players who contributed to the success of the Bootleggers Buzz of round 7. Whether you submitted one freelance article or have been a writer for months, you all contributed your free time for an amazing feature. With that I also want to thank the Elite Guard, which always assisted and helped us when needed and also contributed with plenty of submitted articles and donations for awesome give-aways. Thank you so much! Alright, sniff-sniff. The content of the last two weeks! Dominated or not, we did see some action the last week. To be more exact, some pretty surprising action. A player called Delphic shot at a total of 66 accounts in an attack on behalf of The Family aimed at Most Wanted and Penance. The reason for the attack was one of revenge. It was not very easy to gather some proper information regarding the shooting, but we definitely did our best and found some juicy intel. Anything else exciting? Well, did I already mention the announcement of the new round? Damn, I did. To celebrate the end of round 7 we had a look in our archives and made an overview of some exciting moments during round 7. It was impossible to share all those fantastic moments, but you can always read our previous published issues. There is more! Aldarion wrote an amazing article regarding some records of round 7. Do you want to know the lowest Organized Crime vault of round 7 or the account with the most send messages? The Bootleggers Buzz has it, just for you! Well ladies and gentlemen, this is it for round 7. Issue #100, the last issue of round 7. 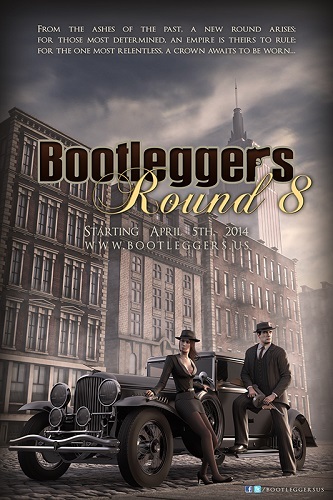 Whether I am the Buzz Editor next round or not, I truly hope you can keep reading the Bootleggers Buzz and once again I’d like to thank all the players/readers who contributed to the big success of the Bootleggers Buzz in round 7. It was an honour to be your Buzz Editor in round 7. I hope I did not let you down and hopefully till next round! Enjoy this amazing issue and have a good Sunday! Nearly two years ago we all witnessed the start of round 7. Round 6 ended dramatically, as one group was totally dominating the streets of Bootleggers and killing all the possible threats. Round 7 was better, but once again we witnessed a not so fancy dominating situation. What else did we see in round 7? We give you, an overview of round 7! The round is over courtesy of words on a picture. Have you read these words carefully and looked at their hidden meanings? Here we discuss some possible meanings behind these phrases! With the planned reset on April, 5th, 2014, this is officially the last issue of round 7. It has been a great year for the Bootleggers Buzz and I’d like to take this opportunity to thank all the players who contributed to this success. Each week we interview a random player of Bootleggers. The victim of this week’s issue: MMacaulay. Two dominant forces in Bootleggers went up against each other when The Family turned fire on Most Wanted and Penance, wiping the latter from the stats. For those who sent me a message and asked why this was never finished, here is the ending which was written a long time ago and I never decided to publish. As the Buzz hits it's milestone 100th issue I have some thoughts on the past and future of this feature and a message to the community! Round 8, time for a new start. Before we do, however, it's time for a quick look back on the statistics from round 7. Have you ever wondered where Voluns comes from? Or how I chose my other names? Since this is the 100th episode I decided to explain them all in detail! Have a read to discover my choices! Round 8 is coming! At this moment the reset date is planned at 5th April 2014. Woohooo! This week, Delphic shot at a total of 66 accounts in an attack on behalf of The Family aimed at Most Penance and Most Wanted. This week we got a very special issue; number #100 AND the last issue of round 7. Thanks everyone who contributed to this amazing achievement! RatFaceRay's last comic for round 7!